If you GOT IT… and they WANT IT… We'll DELIVER-IT! We specialize in overnight deliveries. Pick up in the late afternoon or later, and DELIVER-IT the next day. Envelopes, packages, boxes and pallets. Deliver-IT additionally offers Scheduled and Contracted services for dedicated Next-Day delivery. With a combined experience of over 50 years in the business, our customers tell us first hand that they enjoy working with our friendly and innovative staff. The customer is continually astounded to hear that there is a way to ship for less, and Deliver-It has your back! Our drivers are out day and night servicing our varied client base. With all levels of customer needs being satisfied, from the one stop pick up to elite and complicated mail house services. Photographic proof of delivery makes it easy to see where your package was left. Proof of signature is also viewable using our online tracking tool. Get live ETA's using our online daily tracking tool. Sort your deliveries by type, address, status, or other fields. No waiting on hold for answers about your package. Our fulfillment department has been customized for clients’ individual needs and requirements. Our detailed procedures and protocols create an efficient warehouse and timely processing for all orders. Deliver-IT offers special routed pickups, as well as contracted services, creating a wide array of service options to fit just about any need. 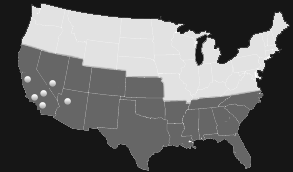 Our Southern California terminals process shipments for deliveries throughout California, Nevada and Arizona.